5 Ton Ductless Mini split air conditioners feature a 60000 BTU Total Capacity which can cool or heat a total of 2000 square feet. 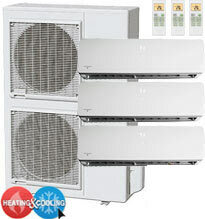 60,000 BTU ductless systems split there capacity between at least two zones. 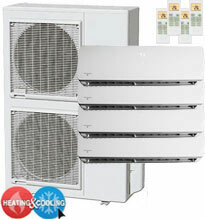 For example, a dual zone 30000 BTU x 2 system which will cover 2 separate 1250 sq .ft. areas or a Tri-zone 24000 BTU + 18000 BTU + 18000 BTU setup. All the below 5 ton ductless splits come pre-charged; include digital remotes and installation kits but they differ in features, zones and price. 1 Year Warranty on Parts - 5 Years on Compressor. Maximum Efficiency: 18 SEER - 10.5 HSPF . Ideal for Commercial and High Demand Applications. Inverter technology for operation in low ambient temperatures. Rapid cooling and heating for areas over 3000 ft². Maximum Efficiency: 18 SEER - 9 HSPF . Maximum Efficiency: 21.5 SEER - Energy Star Certified. Follow Me Technology - Advanced T1C Filtration System. 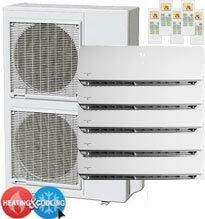 Most Energy Efficient Tri-Zone Series on Market!. Inverter low ambient technology for -13F operation Temps!. 600 ft² + 1200 ft² + 1200 ft² - (3000 ft² total). Compatible for up to 5 Filtration Medias. 900 ft² + 900 ft² + 1200 ft² - (3000 ft² total). Inverter low ambient technology for -13F operation Temps!. . 400 ft² + 600 ft² + 600 ft² + 1200 ft² zones (2800 ft² total). 400 ft² + 400 ft² + 900 ft² + 900 ft² zones (2600 ft² total). Lineset not included - customize lengths on detail page. 600 ft² + 600 ft² + 600 ft² + 1200 ft² zones (3000 ft² total). 600 ft² + 600 ft² + 900 ft² + 900 ft² zones (3000 ft² total). 400 ft² + 400 ft² + 900 ft² + 1200 ft² zones (3000 ft² total). 400 ft² + 900 ft² + 900 ft² + 900 ft² zones (3100 ft² total). Most Energy Efficient Quint-Zone Series on Market!. 400 + 400 + 600 + 600 + 600 ft² zones (2600 ft² total). 400 + 600 + 600 + 600 + 600 ft² zones (2800 ft² total). 400 + 400 + 400 + 900 + 900 ft² zones (3000 ft² total). 400 + 400 + 400 + 400 + 1100 ft² zones (2700 ft² total). 400 + 400 + 400 + 600 + 1100 ft² zones (2900 ft² total). 400 + 400 + 600 + 600 + 900 ft² zones (2900 ft² total). 400 + 600 + 600 + 600 + 900 ft² zones (3100 ft² total). Pre-Charged with R-410A Freon: 13 SEER. 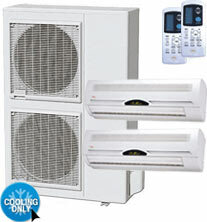 5 Tons: 60000 BTU Total Cooling Capacity. 30000 BTUs x 2: 1250 sq.ft. per area (2500 sq.ft. total). Multi-Folds Evaporator - Wide Angle Spread. Linesets not included - customize length on details page. 54,000 BTU Cooling & 54,000 BTU Heat Pump. 3 Air Handlers for Multi-Zone Placement. Inverter DC Technology for Low Ambient Operation. 850 ft² + 850 ft² + 850 ft² zones (2500 ft² total). 60,000 BTU Cooling & 60,000 BTU Heat Pump. 850 ft² + 850 ft² + 1000 ft² zones (2650 ft² total). Inverter technology for operation in low ambient temps. 12k BTU x 5: 600 ft² x 5 - (3000 ft² total). 4 Air Handlers for Multi-Zone Placement. 550 - 800 ft² per zone (2700 ft² total). Pre Charged with Eco-Friendly R410A: 16 SEER. 63,000 BTU Cooling & 63,000 BTU Heat Pump. 350 - 750 ft² per zone (2100 ft² total). 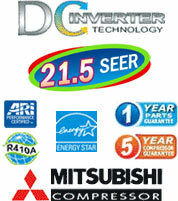 Maximum Efficiency: 21 SEER - Energy Star Certified. 5 Air Handlers for Multi-Zone Placement. 350 - 800 ft² per zone (2800 ft² total). 350 - 950 ft² per zone (2800 ft² total). 9000 + 9000 + 18000 + 24000 BTU. 350 - 1000 ft² per zone (2800 ft² total). 9000 + 12000 + 18000 + 24000 BTU. 66,000 BTU Cooling & 66,000 BTU Heat Pump. 12000 + 12000 + 18000 + 24000 BTU. 350 - 1000 ft² per zone (3300 ft² total). 550 ft² per zone (2750 ft² total).